A value definition val x: T = e defines x as a name of the value that results from the evaluation of e.
In TFSP, do not omit the type annotation T inside the body of traits and classes. Local values within a function can be defined using type inference. This makes sure that the types checked at the function level. The order in which the values are defined is critical when using plain vals. Referencing the values prior to initialization will cause NullPointerException at the runtime. By annotating the values as lazy, initialization can be delayed until the name is first referenced. In the above, buildTrans is marked as lazy, since it's referenced by left that is defined earlier. When pattern matching appears in the left hand side of a value definition, it deconstructs date types using extractors. In TFSP, the use of variables is discouraged. In Scala, most syntacic constructs return a value, which is nice. In Scala, there are literals for integer numbers, floating point numbers, characters, booleans, symbols, and strings. In TFSP, nulls are not allowed. Use Option[A] instead. In Scala, a method call can be written as an infix operation. In TFSP, postfix operations are not allowed. In Scala, if-else syntax returns a value. Always provide an else clause. In Scala, for can be used as for comprehensions with yield and for loops without yield. Always provide an yield. There's a minor syntactic difference based on parentheses or curly braces. In TFSP, always use curly braces. TFSP prefers Either[A, B] or similar data types that encodes failure over throwing exceptions. Case classes in Scala is a good way of emulating algebraic data types. Each case class would correspond to a constructor of an ADT, and the ADT itself would be represented by a sealed trait. Under the hood, case classes are classes with automatically implemented equals, toString, hashcode, and copy. In addition, their companion objects automatically implement apply and unapply. Because the trait is sealed, the compiler can help us in exhastiveness. In TFSP, case classes will not have methods. More on this in the next section. Both modern object-oriented and functional programming are trying to claim the concept of modularity, but neither objects nor functions are intrinsitcally modular. The key aspect of the object is associating verbs together with nouns, and mapping them as metaphors to the human world. The key aspect of the function is mapping values to another, and treating the mapping also as a value. Modularity is about defining cohesive modules that are loosely-coupled, and it's rooted in more engineering than mathematics. In modular programming, modules communicate via interfaces indirectly. This enables encapsulation of the modules, and ultimately the substitutability of the modules. In Scala, defining typeclasses with trait would be the most flexible way of implementing the modules. First, the typeclass contract would be defined with a trait that only declares function signatures. The way the default instance of TreeModule was defined is an example of an anonymous type with refinement, or a refined type for short. Since the type doesn't have a name, any fields that are defined in the type should be hidden from the outside except for depth. In Scala there are several ways of enabling TreeModule. One way is to create an object of TreeInstance, and importing all the fields under it to load them into the scope. TFSP prefers explicitly importing the implicit values over implicit scopes. This reduces the need of companion object. The implementation of the depth function is completely substitutable, because the data that deals with it is separated from the module and because TreeModule is abstract. TFSP prefers traits over classes. Except for working with external libraries, there shouldn't be a need for plain classes. Scala has first-class functions, which are functions that can be treated like values. Having first-class functions enables higher-order functions, which is useful. What's interesting is the number of ways you can end up with a function in Scala. In Scala, a sequence of cases defines an anonymous partial function. I'm going to call this a case function since "pattern matching anonymous function" is too long. Since PartialFunction extends Function1, a case function can appear in any place where a function is expected. In Scala, a function may take multiple parameters, or it could be curried as a function that takes only one parameter and returns another function. In TFSP, curried functions will be the default style unless it makes sense to pass tuples. This makes partial application the default behavior. In TFSP, the anonymous functions using placeholder syntax such as (_: Int) + 1, will not be allowed. As fun as it is, removing it would reduce the numbers of way a function can be created. In Scala, def methods can exist side-by-side with the first-class functions. TFSP prefers the first-class functions over defs. This is because functions should be able to fulfil the def method's tasks in many cases. An exception is defining functions with type parameters or implicit parameters. In TFSP, method overloads are not allowed. In Scala, polymorphism can be achieved via both subtyping and typeclasses. TFSP prefers ad-hoc polymorphism using typeclasses over subtyping. Typeclasses offer greater flexibility since the behavior can be added to existing data types without recompilation. For example, we can generalize the TreeModule as Depth[A] that supports both List[Int] and Tree. To take advantage of the Depth typeclass, define a def method with a context-bound type parameter. I've mentioned that in modular programming, modules must communicate indirectly through interfaces. So far we have only seen one module. How can we desribe a module that depends on another one? Cake pattern is a popular technique of doing this, but we can do something similar using implicit functions. Suppose we have two modules MainModule and ColorModule. I would like to define a MainModule instance that depends on a ColorModule. A MainModule can be instantiated normally. In Scala, a type parameter can be annotated as covariant or contravariant to indicate how the type constructor behaves with respect to subtyping. Since TFSP avoids subtyping altogether, variance annotation should also be avoided. In Scala, an existing type may be wrapped implicitly to inject method that did not exist in the original type. If it is desirable to have methods on data types, using method injection allows us to emulate methods without compromising modularity. The technique of injecting methods using typeclass was inspired by Scalaz 7's implementation. Here's how we can inject depth method to all data types that supports Depth typeclass. I've been listing the language constructs from Scala, but it's hard to see just how different or useful this subset is without writing some code. 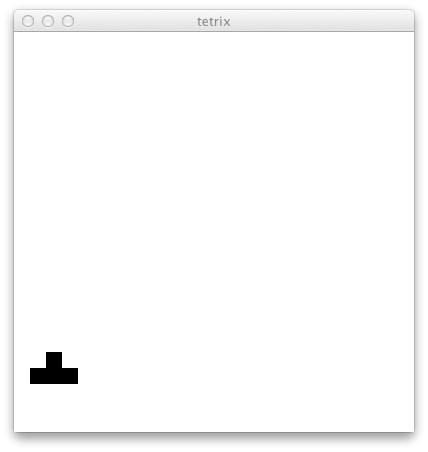 Naturally, Tetrix came to my mind as the test program. First, MainModule was defined to wrap the Swing UI. ColorModule determines the color setting used in the application. This is the module in its entirety. It is a bit of overhead to express just two fields, but the point is to demonstrate that these settings can be configured to something else after the fact. Now the blocks are rendered in another color configuration. This alternative setup can be defined in another jar without recompiling the first jar. This module depends on another module called PieceModule, so module instance is defined as the implicit function toMachineModule. Since implicit parameters are resolved at the call-site, PieceModule can be substituted to an alternative instance at the top-level application. As you can see, all functions are implemented as curried function values. Here is an example that takes advantage of the currying. buildTrans is a function that takes Piece transformation function, and the initial State and returns another State. By applying only the first parameter, it can be also seen as a function that returns State => State function. Actually writing code using TFSP, even for a toy project, gave me a better understanding of the subset. The implementation of the modular dependency, for instance, went through several iterations of try-and-error to be able to substitute arbitrary modules correctly. Overall, I am pleasantly surprised that this subset seems usable thus far. I did not complete Tetrix, but since I got to the point where I could move the block around with collision detection, I figure it's just matter of spending more time. Except for a few def applys, all functions were defined using val. This did not cause troubles for the most part. The only thing I had to watch out for was the initialization order, which I wouldn't need to worry if I were using def methods. The initialization issue can go away if we always used lazy vals. Some of the functions that return a mutable object was implemented as Unit => X, like val init: Unit => Machine. This results in init and init() having different semantics, which is not common in idiomatic Scala. Giving up placeholder sytanx for anonymous functions resulted in parameter named having throw-away names. This is a tradeoff for reducing the syntactic constructs for functions. The differentiating aspect of TFSP is the modularity. Without relying on heavy subtyping, TFSP can define modules that are loosely coupled. It's also interesting that TFSP achieves encapsulation without marking any functions private. Other dependency injection solutions like Cake pattern and SubCut probably could achieve these things too. Since Scala allows wide spectrum of style, it's useful to ponder your own subset to see where you fit in. One use of the subset is to write majority of the code in it, and treat the rest of Scala as FFI to talk to other libraries and Java. The first two points can be found in some of the functional- or modular- oriented code bases. TFSP just applies them strictly to everything possible. The last two points would be considered diversion from normal Scala. But, in a way it's the parts that feels awkward if one reviewed the language with fresh eyes. For example, it's a bit odd to have two notions of functions: first-class functions that can appear anywhere, and methods that has implicit passing of this. If possible, it's natural to unify them towards val. The implicit scope via companion object is another oddity that's great if you understand it, but the idea of tying things together based on names feels a bit like magic. We will be landing shortly to Newark Liberty International Airport. The weather forecast is sunny, at 72°F or 22°C. Please make sure your seat backs and tray tables are in their idiomatic positions. On behalf of the crew, I’d like to thank you for joining us on the flying sandwich.